On a cold night in January 2012, Dustin Bergsing climbed on top of a crude oil storage tank in North Dakota's Bakken oil field. His job was to open the hatch on top and drop a rope inside to measure the level of oil. But just after midnight, a co-worker found him dead, slumped next to the open hatch. Even though an autopsy showed Bergsing had hydrocarbons in his blood — things like benzene and butane — the Occupational Safety and Health Administration's investigation found no safety violations. And it didn't fine the oil company. Reporter Mike Soraghan came across Bergsing's case while researching oil field fatalities for EnergyWire, an online business publication. "A 21-year-old kid just sort of dies out in the middle of nowhere and nothing happens?" Soraghan says. "I just remember reading through it and thinking, 'That's it?' "
With the help of Dr. Bob Harrison, who specializes in occupational and environmental medicine, and the National Institute for Occupational Safety and Health, a pattern was uncovered: nine oil workers found dead on oil pads in the past six years, many of them young and otherwise healthy. Based on Bergsing's autopsy, Harrison believes they passed out after they opened oil-tank hatches and were engulfed in large amounts of petroleum gases. "It was one of those aha moments that I have every so often in my career as a doctor treating patients with toxic-chemical exposures," he says. Families of at least six of the deceased are suing their employers. Since last year, NIOSH has warned the industry about the hazard, but exposure continues — in part because another federal agency's rules make it difficult to use safer measurement methods. The Bureau of Land Management is in charge of oil development on federal land, and critics say the agency is wary of technology that might not be as accurate as putting guys on top of tanks to measure oil by hand. There's public money at stake — royalties that are paid by the oil companies on the exact amount of oil coming out of the ground. "If it's a public asset, then the taxpayer deserves to have their money, their assets protected," says Steve Wells, who oversees oil production for the agency. And since 1989 — the last time the rules were updated — the industry practice for protecting those assets is to measure them manually by dropping a rope into the tank, as Dustin Bergsing did when he died. The agency is updating those rules this year, but Wells won't say whether the new rules will allow automated oil measurement. One thing the rules definitely won't do is ban measuring oil levels by hand. "You have some very old facilities, very simple tanks, so the idea is that we're trying to accommodate all the different operations," Wells said. And with 83,000 oil wells on federal land and a $2,000-per-tank cost for automatic measurement equipment, Wells said requiring such an upgrade would cause some companies to shut down. Truck driver Ryan Ehlis makes his living hauling crude oil in North Dakota, and has some firsthand experience with the dangerous fumes. Like Dustin Bergsing, he spends a lot of time climbing atop large oil-storage tanks and opening their hatches to measure the oil. He says he tries to avoid the gases, but just the day before, he'd had a dizzy spell after climbing back down from one of the tanks. "If there's gas in your face, kind of hold your breath and then get your gauge and then step away and get into the fresh air and [take a deep breath] — and then go do something again," he says. "But you can't avoid it entirely." 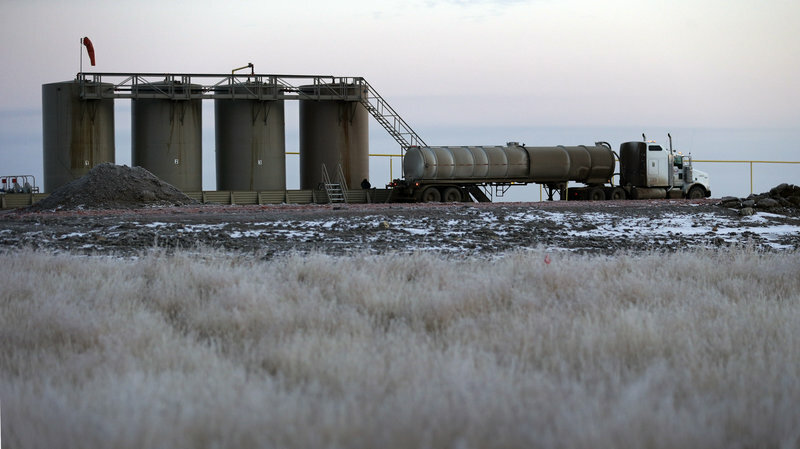 That's needless, nonsensical exposure, says Dennis Schmitz, an oil and gas safety trainer. Automatic measurement is common in Canada and in the offshore oil and gas industry, which isn't regulated by the Bureau of Land Management. In fact, Schmitz used such equipment on tanker ships. "And I never really questioned, 'Why is it in the offshore environment that I don't breathe the vapors there, and I do breathe them here?' " he says. Ehlis says he has thought about getting a safer job — particularly after seeing a truck on an oil-well pad explode into "nothing but a huge orange fireball probably 50 feet in the air" — but that nothing in the area pays as well. So Ehlis keeps driving, keeps climbing oil tanks and opening their hatches, keeps lowering a rope into the tank to measure the level. This story was produced by Inside Energy, a public media collaboration focused on America's energy issues. Contact reporter Emily Guerin at eguerin@insideenergy.org.